It was high summer. The crisp morning air formed a stark contrast to the hot midday temperatures of the past few days I had spent in the valley. The patches of snow reminded me how lucky I was to be able to drive here in the first place. When I arrived in Prad am Stilfserjoch – or Prato allo Stelvio; this area is bilingual – a couple of days earlier, I thought I would have to change my route. I was hugely disappointed, because this road was supposed to be the highlight of my first ever solo road trip. I had wanted to come here ever since I saw Top Gear’s quest to find the greatest driving road in the world. 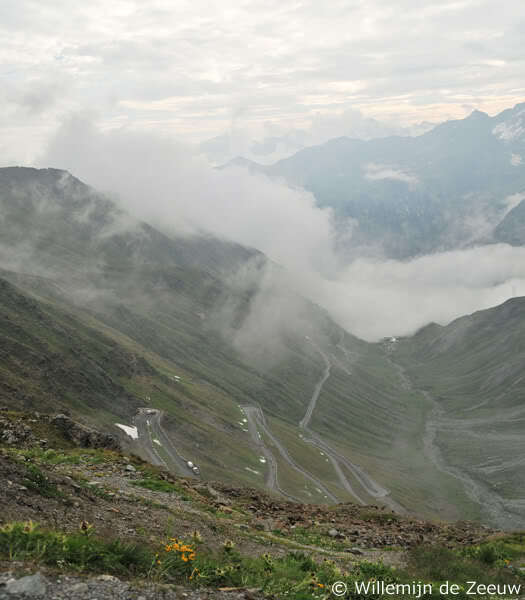 The Stelvio Pass, in the north of Italy, not far from the borders of both Austria and Switzerland, was built in the 1820’s by the Austrian Empire, in order to connect Austria with the province of Lombardia, which fell under Austrian rule at the time. Despite the fact that this magnificent landscape is now a part of Italy, most people still speak German here, hence why every town and every landmark is known by two names. 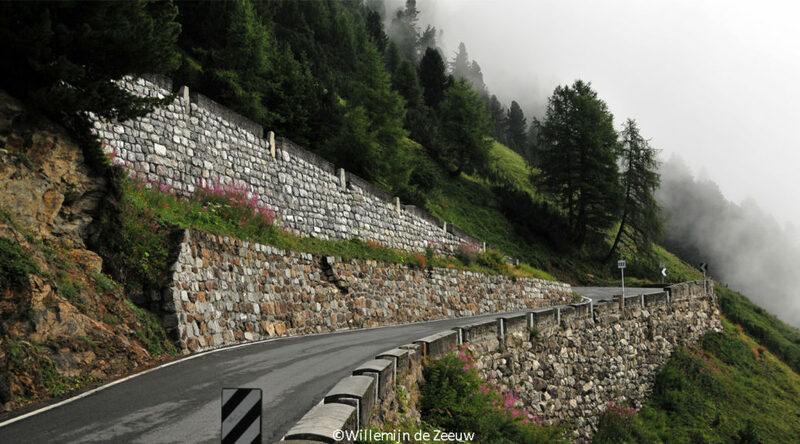 The Stelvio Pass is no exception; it is known by the German name Stilfserjoch as well as the Italian name Passo dello Stelvio. 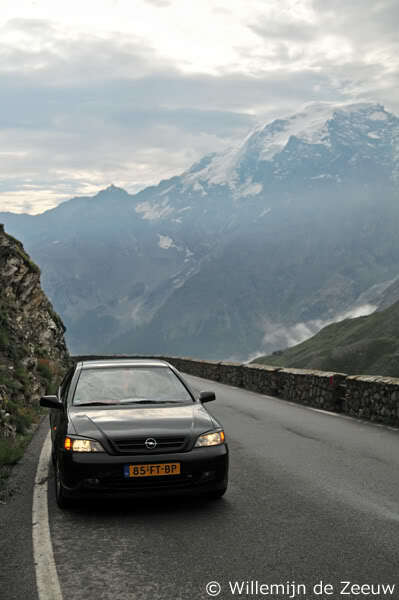 It is the highest pass in the Eastern Alps – one of the highest paved roads in Europe – reaching an altitude of 2760 metres. Upon my arrival in the valley, my ‘neighbours’ on the campsite had pointed at the white peaks and told me that three days earlier – while it was raining in the valley – thirty centimetres of snow had fallen in the mountains, causing the road to be closed. Thankfully, this was not as unusual to the locals as it was to me. Within a few days, the road had been cleared and was open once again. After spending two days exploring the valley, I left the campsite at 8 AM, in order to beat the crowds. This famous road is extremely popular among both bikers as well as the owners of fast cars, who treat it like a race track. No doubt this had only become worse ever since it was declared “The Greatest Driving Road in the World”. In my attempt to beat the crowds, I had left so early, that I got to have the road to the top and its 48 hairpin turns almost entirely to myself. Save for a handful of locals – you can tell by the way they drive on this road like they own it – not a single person was to be seen. As I leant against my car and admired the view, the mountains woke up. Ever so slowly, the fog lifted enough for me to see the road back to the valley where I had just come from. A long ribbon of tarmac draped gracefully along the side of the mountain. The fluidlike twists and turns could do nothing to diminish the sheer beauty of the mountains. If anything, it added to it. Looking down on that narrow strip of pavement, I suddenly became aware of the vast scale of this landscape. In total, the road climbs about 1800 metres, but I had not realised what that meant, until I looked back, and when the penny dropped, it took my breath away. I realised that here, humans are not in charge; the mountains are. The pass can only be used for about four months every year. People may have chosen to build a road here, but if mother nature decides that early August is the perfect time for a fresh layer of snow, all we can do is wait while the sign in the valley informs us the road is closed.